Have you ever considered the indicatives of 1 John 3:1-3. My wife painted these verses on the wall above the crib where our children slept when they were infants. 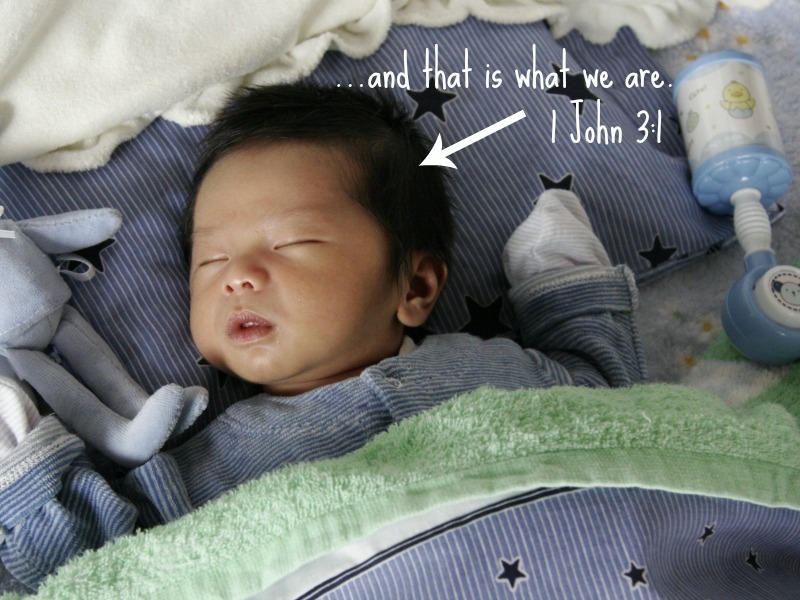 When I saw them in the crib with that verse above them, it served as a visual reminder to me that we are children of the living God and that God delights to make us his children. That little helpless person in the crib? That one who is so tender and dear to me? The one I love with all my heart? That is me before the Father in the love of Christ. Can I remember that even as my heart is constantly making idols looking for other fathers, other delights, out of professors, school work, ministries, services, and similar temptations? The indicative of our sonship will empower the imperative of our joyful obedience to Christ. To reverse this is to sink ourselves under the weight of works righteousness, the erroneous idea that we somehow merit sonship by what we do instead of by the love of God in Christ. Whatever we are going to experience as Christians, it is going to begin and be founded on our sonship to our Father. Our sonship is the easiest thing to forget and the most important thing that the devil would have us forget as he is seeking to steal, kill, and destroy our joy in Christ.